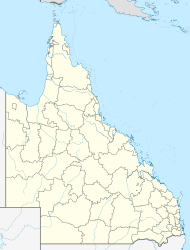 Yabulu is a small residential suburb approximately 25 kilometres (16 mi) north of Townsville, Queensland, Australia. At the 2011 Australian Census the population of Yabulu was 675. The Bruce Highway passes through the suburb which fronts Halifax Bay. Yabulu is the site of a major nickel and cobalt refinery, owned by Clive Palmer. Facilities located at Yabulu include a Caltex service station. The Palmer Nickel and Cobalt Refinery is operated by Queensland Nickel, wholly owned by Clive Palmer. The Yabulu refinery became operational in 1974 after completion of the Greenvale to Yabulu railway line. Mining at Greenvale took place between 1974 and 1992 during which nickel laterite ore was transported to the Yabulu refinery by rail and processed up until 1993. Importation of ore from mines in New Caledonia, Indonesia, and the Philippines began in 1986 and continues to this day. In 2009, Palmer bought Queensland Nickel and the Palmer Nickel and Cobalt Refinery. The following year, the company increased production by 30%, prompting him to give $10 million worth of Christmas bonuses to staff,including 55 Mercedes-Benz B-Class cars and overseas holidays. Up to 750 people worked at the refinery, which produced 32,000 tonnes (71,000,000 lb) of nickel and 19,000 t (42,000,000 lb) of cobalt per year. According to the general manager Trefor Flood this figure had risen to 12,000 t (26,000,000 lb) of nickel per month by early 2010. World Wide Fund for Nature Australia (WWF) raised concerns that a tailings dam at the site could collapse during the wet season, posing an environmental threat to the Great Barrier Reef. WWF later retracted their comments, apologised and were forced to pay legal costs incurred by Palmer who sued WWF because of the comments. On 15 January 2016 the company terminated 237 workers. Poor nickel prices, at a 12-year low, and the refusal of the Queensland government to guarantee a loan of A$35 million were blamed. On 18 January 2016 Queensland Nickel entered voluntary administration.It is expected the refinery will re-open sometime in late 2018/2019 if all current hurdles to restarting are overcome. ^ a b Australian Bureau of Statistics (31 October 2012). "Yabulu (State Suburb)". 2011 Census QuickStats. Retrieved 16 January 2013. ^ a b "Queensland Nickel: Our History". Queensland Nickel. Retrieved 16 January 2013. ^ Nickel and Cobalt Refining by QNI Pty. Ltd. Yabulu, Qld. ausimm.com.au, Accessed 10 June 2008. ^ Michaela McNamara (21 November 2010). "Queensland Nickel Employees Get Mercedes & Vacations for Christmas". Business Review Australia. Archived from the original on 10 November 2011. Retrieved 5 March 2012. ^ BHP Billiton - Yabulu Refinery, bhpbilliton.com, accessed 10 June 2008. ^ Peter Michael (31 January 2010). "Cliver Palmer refines fortunes at Yabulu Nickel refinery". The Courier-Mail. Queensland Newspapers. Retrieved 16 January 2013. ^ "Palmer returns fire at green groups". Brisbane Times. Fairfax Media. 10 January 2013. Retrieved 16 January 2013. ^ David Chen (5 March 2013). "WWF apologises to Palmer over 'unfounded' refinery claims". ABC News. Australian Broadcasting Corporation. Retrieved 5 March 2013. ^ Cauchi, Stephen Cauchi (25 November 2015). "Nickel prices fall to 12-year low, Western Areas share price falls". The Sydney Morning Herald. Faifax Media. Retrieved 21 January 2016. ^ Bavas, Josh; Tapim, Francis; & staff (18 January 2016). "Palmer under pressure to pay back millions to struggling refinery". ABC News. Australian Broadcasting Corporation. Retrieved 18 January 2016. ^ "Clive Palmer's Queensland Nickel goes into voluntary administration". ABC News. Australian Broadcasting Corporation. 18 January 2016. Retrieved 18 January 2016. ^ "Queensland Nickel approves plans to restart Yabulu Refinery - Australian Mining". Australian Mining. 6 June 2018. Retrieved 2 September 2018. This page was last edited on 3 December 2018, at 03:05 (UTC).